Two votes by the School Building Committee on Wednesday night moved the projects at Watertown’s three elementary schools and at the high school a step closer to being a reality. The projects to renovate and make additions to Hosmer, Lowell and Cunniff elementary schools, which have schematic designs, are ahead of the Watertown High School project, for which designs have yet to be drawn up. Wednesday night, the School Building Committee, which oversees the projects, gave its approval to spend $1.6 million on the preliminary design and hiring an owner’s project manager for the WHS project. The Town Council will be asked to give final approval for the money at its Nov. 13 meeting, said Superintendent Dede Galdston. When the Watertown Schools receive the approval from the town, it will then submit this and other items to the Massachusetts School Building Authority board in December as part of the initial eligibility period. The state has invited Watertown to submit the project for state reimbursement, which could be around 48 percent, Galdston said. The district will soon find out how much reimbursement it is eligible for. The schematic design and feasibility study will take up to two years, after which the project scope, budget and schedule will be submitted for authorization by the MSBA board, according to a schedule presented by Galdston. 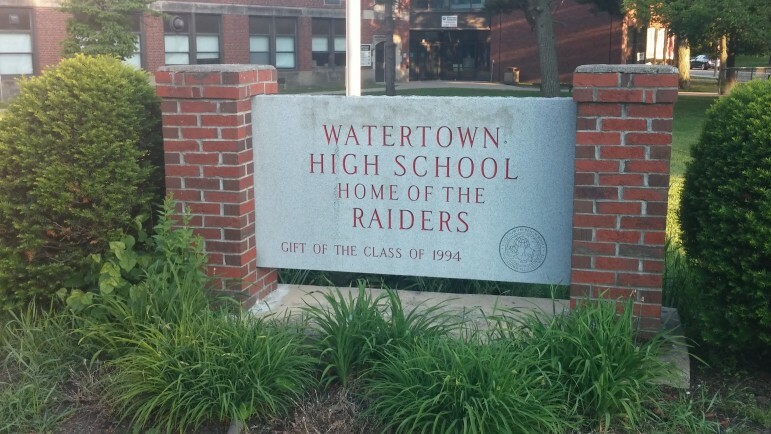 When that is obtained, which will be no earlier than July 2020, the Town will have 120 days to go to the voters to get approval for Watertown’s portion of the funding. The design process for the Town’s three elementary schools, meanwhile, is well underway. The schematic designs are almost complete, and the School Building Committee will soon be presenting the proposals to the school communities and residents of surrounding neighborhoods. On Wednesday, the committee voted to have the current designs be the ones shown to the communities during three community meetings — one at each school. Town Council President Mark Sideris, who chairs the School Building Committee, said the meetings will likely take place in November, and will be finished by mid-December at the latest. Word about the meetings will go out to people living near the schools, as well as to families with children currently at the schools, Sideris said. The biggest change will be at Hosmer School, where the main classroom building will be torn down, and a new one will be built onto the cafeteria/auditorium building on the side facing Mt. Auburn Street. Lowell School will have a few small additions, including a small classroom wing near George Street, an expanded cafeteria, and an additional physical education area next to the gym. Parking has also been proposed to be added along George Street, on the edge of the playing field. The one story wing in the back of Cunniff School will be torn down and an addition covering that area and part of the playing field will be built. At all three schools, the sections that are remaining will undergo renovation, sometimes major ones. The elementary school projects will be paid for by the Town, and Town Manager Michael Driscoll said the Town Budget allows for spending $80 to $120 million without having to have a tax increase. However, cost estimates came in higher than first projected by a different architecture firm, so Sideris said the School Building Committee will have figure out how much it will cost and then send a request to the Town Manager for additional money. The School Building Committee will also have to decide which construction delivery method to go with for the elementary school projects. Massachusetts allows public projects to use either the traditional Design-Bid-Build method or the Construction Management at Risk method. In Design-Bid-Build, the town designs the project and puts it out to bid. The winning bidder will be the the lowest “eligible and responsible” general contractor. The general contractor brings in subcontractors and oversees them. In Construction Manager at Risk, the general manager is hired before designs are finalized, so changes can be made. The town would be involved in selecting subcontractors and trades. Shane Nolan, the owner’s project manager from Daedalus, said that the Construction Manager at Risk works better with a complex project, such as Watertown’s elementary school project where all three will be staggered so that Hosmer can be built first, and then the old part of the school would house students from the other schools while their buildings are being renovated. The Construction Manager at Risk tends to cost more than Design-Bid-Build in the beginning, but often evens out, said School Building Committee member Paul Anastasi, a former school facilities manager. “My experience with the ones with the low bidder is they know how to make up the difference with change orders,” Anastasi said. One benefit of a Construction Manager at Risk is they can take a look at the conditions of the schools, including the wiring and plumbing inside the walls, to see what work needs to be done with those systems, said Committee member Kelly Kurlbaum, an architect who has worked as an owner’s project manager. Any cost savings when using a Construction Manager at Risk goes back to the owner, in this case the town. Scott Dunlap, the architect for the elementary school projects, said it is important to have a good, experienced Construction Manager at Risk. He worked with a good one that found a different way to make the foundation, savings $3 million. A not-so-good one would suggest, for instance, not using tiles on the walls, which could save $1 million, but in the long run would get damaged and would not last as long. The School Building Committee will make the decision on whether to go with Construction Manager at Risk or Design-Bid-Build at a later meeting.